Available in 3 versatile and popular models, these premium sharpeners will produce excellent, consistent results time after time, year after year. Innovative, multi-patented DuoSharp® Bench Stone is a precision flat, two diamond surfaced sharpener guaranteed to provide consistent, even sharpening every time. Now offered with Hardcoat™ surface for extra durability when used specifically for the hardest steels and ceramic blades. Designed to withstand the rigors of sharpening ceramic knives, this 8" DuoSharp® Bench Stone, is an excellent counter and bench sharpener, with a larger, wider diamond surface for sharpening a variety of edges. The model comes with a Bench Stone Base Accessory. HC™ Extra-Fine diamond (9 micron /1200 mesh) to polish and refine a razor edge after sharpening with a coarser diamond; HC™ Fine diamond (25 micron / 600 mesh) for a razor sharp edge. 12-in. Diamond Steel™ with proprietary Hardcoat™ Surface. 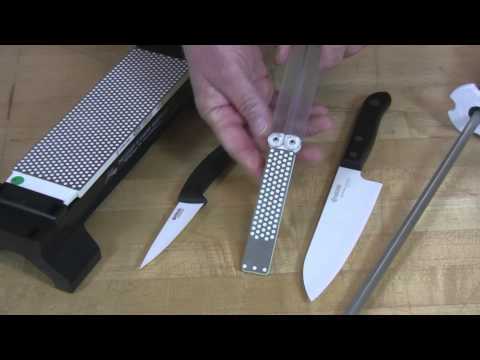 Like all DMT Sharpening Steels, Diamond Steel™ HC™ sharpens as well as hones and with the tough, new surface is designed to stand up specifically to the rigors of sharpening ceramic blade sharpening. 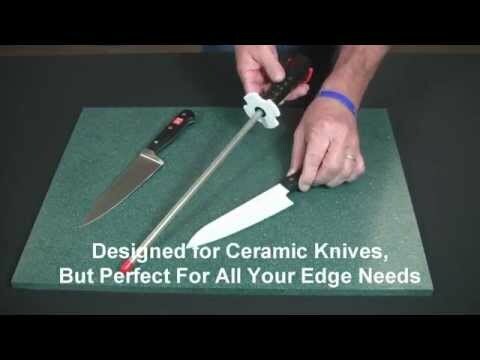 While all diamond steels can sharpen ceramic knives, the Hardcoat™ surface allows for extra high durability when used specifically for ceramic blades. The diamond sharpening rod has a sanitary black plastic handle with large white guard and color coded ring for easy grit designation and hang-up. HC™ Fine diamond (25 micron / 600 mesh) for a razor sharp edge. Two stage sharpening with compact convenience. One of DMT’s signature products now outfitted with the proprietary Hardcoat™ surface for extra durability when used to sharpen ceramic blades. While all DMT diamond sharpeners can sharpen hard steels and ceramics, the HC™ surface provides for extra long life when used for ceramic blade sharpening. Two different grits combined to create a lightweight sharpener that is great for home, camper, tool box, gardening shed and more. Includes a continuous surface that can be used for small or pointed edges. HC™ Extra-Fine diamond (9 micron / 1200 mesh) to polish and refine a razor edge after sharpening with a coarser diamond. HC™ Fine diamond (25 micron / 600 mesh) for a razor sharp edge. Folding plastic handles protect sharpener when not in use.